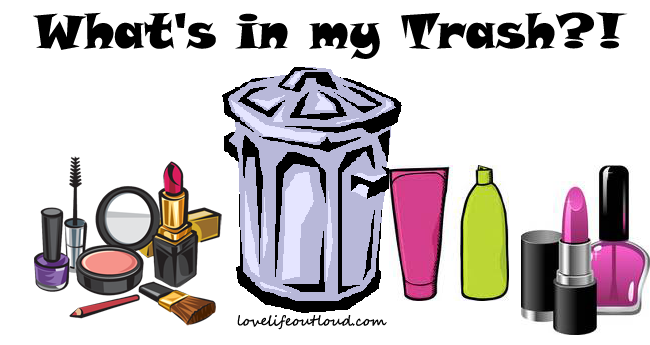 Despite how crazy my empties collections always gets, I think these What's in my Trash?! posts have to be my favorite ones to write! There's nothing better than getting to throw away a bunch of trash while at the same time writing a whole bunch of mini reviews. It's also a great motivator to work through samples because too often I get stuck in a rut using my tried and true products or I trick myself into thinking I'm setting things aside for travel (spoiler: I don't get to travel that much), so these empties posts are great for a bunch of reasons! This is another month of lots of empties, I'm really trying to catch up here, I'm not going to lie most of these empties are from DECEMBER, yeah two whole months ago, that's just how many things I've been using up it's ridiculous. Let's just get into it. Miracle Mud Mask Sample. It had a nice tingly sensation and tightened my face nicely while I was using it but there was nothing miraculous about it and it won't be something I will buy since I have so many tried and true masks already. Borghese Gel Makeup Remover. It didn't do its job very well, removing makeup, so not something I would buy. H2O+ Night Oasis. This was strange it was a bright blue gel and kind made me feel like I was rubbing toothpaste on my face. It worked, it wasn't overly hydrating but I probably won't buy it. Jane Iredale Longest Lash Mascara. I don't think this really did anything, the weird squeezy tube it came in was bizarre. Jane Iredale Purelash Extender & Conditioner. I didn't really see a difference with this, I'm not even sure if it is completely empty or not but I really can't be bothered to for all these steps (I already do two different mascaras anyways) so it just went into the trash. Derma E Microdermabrasion Scrub. This was a great scrub that got the job done. I found other scrubs that I like better, but if it weren't for those I would have repurchased. Garnier Fructis Hydra Recharge Shampoo & Conditioner Samples. This is the shampoo I already use normally I just got a little sample packet of it so that was very handy for travel (hence the different counter top, that was taken at my sister's place!). Nivea Skin Firming Hydration Lotion. I got this in a VoxBox, I don't think it really firmed and it didn't soak in very well. Not something I would buy. Lord & Berry Eye Liner. This was the tiniest liner but it took forever to finish! This was featured in my Project Pan for the longest time and finally it got to the point where I can no longer pull the cap off anymore so it is done. Benefit They're Real! Mascara. This most wonderful mascara already has many back ups in my collection. I love it and totally think it is worth the designer price tag! Dran Aqua Wonder Serum. I was a huge fan of this as a light morning serum, I definitely saw a difference in brightening my skin. If I can ever find this somewhere easily accessible (this is a Korean product) I will definitely pick up more! Paula's Choice Clear Skin Hydrator. I liked this for a morning moisturizer in how it felt on my skin but unfortunately it also broke me out (ironic) so sadly I won't be buying this. Evologie Stay Clear Cleanser. I saw no difference using this cleanser and I hated the packaging, the cap was incredibly hard to pop off so I think I wasted a lot of it since I ended up unscrewing it and squeezing it out that way. I'm sure the full size product is a lot better but since it wasn't effective for me I'll pass. Harvey Prince Liquid Loofah Sample. I didn't see anything crazy with this product but this smell I am in love with! I'm tempted to buy the perfume of the scent but I have way too many perfumes right now so I'm going to finish up one before I pick it up! St Ives Oatmeal & Shea Butter Body Wash. Favorite body wash everrr. Already have a back up (or ten). Secret So Very Summerberry Deodorant. I love this scent, I mixed it up this time around but I think I'm going to go back to it. It's just so fruity and nice! Philosophy Miracle Worker Overnight Sample. I actually loved this for a night moisturizer and after I finish my cream stash I am definitely picking it up! It's thick and moisturizing and makes my skin feel baby soft in the morning, it really is a miracle! Vasanti Detox Facial Cleanser Sample. I've had this sample before, not too impressed with it, it's just an average cleanser. Suki Face Transformative Cleansing Clay. I wasn't crazy over this stuff, it didn't really do much and was extremely runny. I won't be purchasing this again. Murad Pore & Line Minimizing Hydrator Sample. Murad products just don't work well with my skin. I haven't found a single moisturizer that doesn't cause me to become ridiculously oily and this one was no exception. Renu Contact Lens Solution. Not my solution of choice but I finally finished this second one in a two pack. Rimmel Stay Matte Powder. Hands down the best mattifying powder in the drugstore if not ever! I was going to try and force myself to use up other powders in my collection but I just needed this and ran out and bought a replacement already.